Nasal rinsing with salt water is recommended by doctors as the best natural way to keep your sinuses flowing nicely to beat allergy symptoms, sinus infections and headaches. 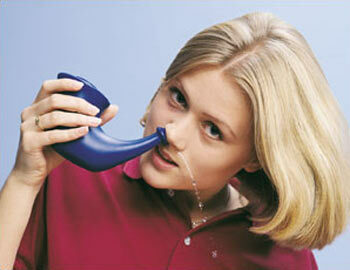 Nasal rinsing is a thousand year old Yoga practice using a Neti Pot or nasal Rinse Bottle. There are all kinds of neti pots and nasal rinse bottles out there, but they all work basically the same way. Water flows through one nostril and comes out the other side, to thoroughly cleanse your sinus cavities. Here’s a homemade recipe that anyone can make with ordinary ingredients and it works beyond regular saline rinses. Add the Eucalyptus Oil, Lemon Juice and Peppermint Oil and Baking Soda to the Dendritic Salt in a closed container. Shake thoroughly until mixed. Add the Sea Salt and shake again until mixed thoroughly. Add (1/4 – 1 Teaspoon) per 8 ounces of water depending on your preference and shake well in a neti pot or nasal rinse bottle. You can use luke warm or room temperature tap water, but I prefer distilled water at room temperature. Use once daily to flush out your sinuses and twice daily when you’re experiencing a sinus infection or allergy symptoms. You can keep this mixture for up to 1 year at room temperature. I haven't seen anything like this before but it really looks very effective. Thanks for the review. I like the the way suggested in the post for curing sinus problem.It is natural and very effective.Thanks for sharing.